Between the urge to hibernate and going off the rails with holiday goodies—winter can wreak havoc with your health habits. But spring, yes, spring brings the promise of something new! 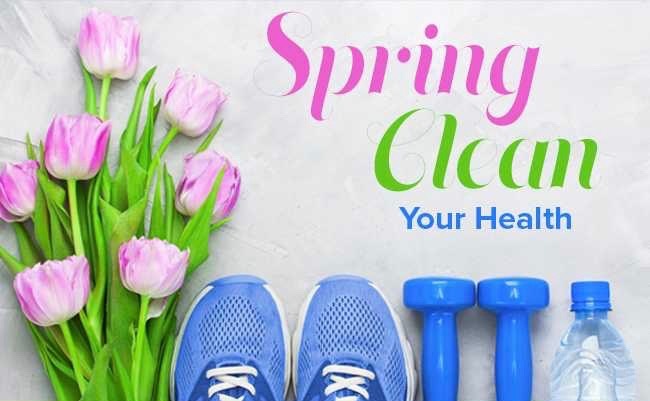 Here are some ideas to help you spring clean your health. I’ll bet you can think of more. Add a vegetable or fruit serving to every meal. To keep things interesting, try for a variety of colors, textures, and flavors. Choose local, organic, in-season produce whenever possible. Soon, local farmers’ markets will be overflowing with bounty…. Berries and broccoli and beans—oh my! Add a new activity, something you really enjoy, like dancing. It’s easy, free, and available right in your own kitchen or living room. And the kids (or grandkids) can join in on the fun. Add an educational show to your menu of viewing choices. Maybe it’s a documentary or something featured on PBS or the Discovery Channel, for example. Make it a weekly viewing party. You’ll create a social outlet and increase engaging conversation—great for your mind and emotional health. Now, you can take a look at that list of habits to axe! Maybe its too much sugar or hefty portions of food. Could you start by getting rid of sugary drinks or by using smaller plates to help manage portion sizes? Take it outside. It’s spring. Take advantage of nicer weather and get outside. Researchers are increasingly finding health benefits of getting into nature—like lowering blood pressure and stress and boosting the immune system. Speaking of nature, spring is also a great time to plant a vegetable garden. When you harvest your own food and find creative ways to prepare it, you may find it easier and easier to eat enough veggies. With extra time outside, it might also be a good time to replace your worn-out walking or running shoes. Over time, they lose their cushioning effect, which may increase the chance of chronic foot pain. Don’t rely on a glance at the treads to know when to pitch them. If you walk up to an hour, three times a week, get a new pair of walking shoes every five months—sooner if you walk more. Clean out your meds. As long as we’re on the subject of spring cleaning, why not do at least a little actual spring cleaning? April 28 is National Prescription Drug Take Back Day. It focuses on providing safe, responsible, and convenient ways to dispose of medicines. If you have any questions about when and how to get rid of your medicines, you know can always talk it over with our pharmacists.